For Albertans, budget 2014 will be remembered as a missed opportunity. The provincial government failed to take action to address a major challenge to provincial society: growing income inequality. This fact sheet focuses on the province's flat tax: a key contributing factor to income inequality in Alberta. Today Alberta has the highest level of income inequality in the country, and the only ones benefiting from single rate tax are the wealthy. Since the flat tax was introduced in 2000, there has been a significant shift in the province's tax burden from the well-off to the middle class and working poor. For most Albertans, those making between $25,000 and $150,000 a year, it is a myth that their personal income taxes are lower in Alberta than anywhere else in the country. 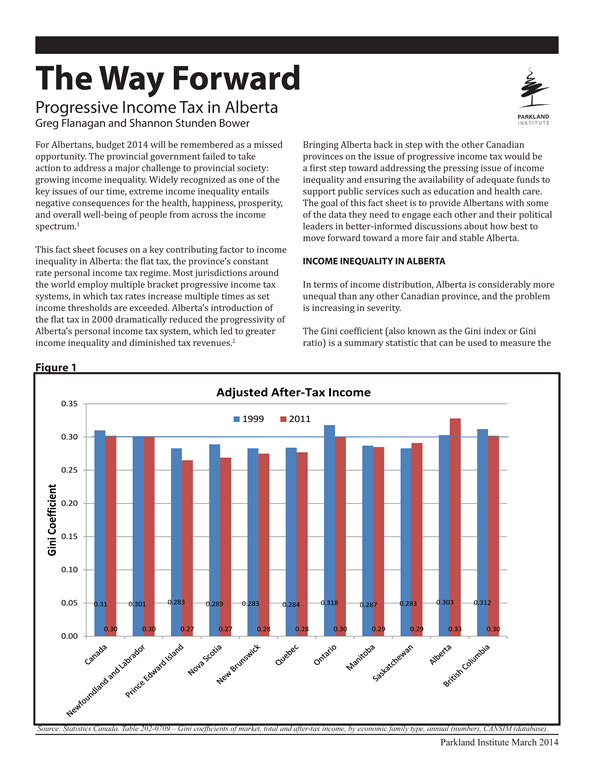 Returning to a progressive tax structure is a necessary first step in decreasing inequality, improving quality of life and well-being, and securing a stable source of revenues in Alberta.